Date or Date Palm (Arecaceae) is a flowering plant , cultivated for its edible sweet fruit. Dates are rich in several vitamins, minerals and fiber too. Some health specialists have suggested that a daily intake of dates would contribute to a balanced and healthy diet. 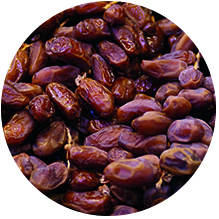 Dates are very nutritious because of their high content off vitamins and minerals including iron. They are full of antioxidants. Such as beta-carotene, lutein and zeaxanthin. These antioxidants protect against the free radicals which can be a cause of certain cancers. They also contain fiber & amino acids that are very good for the digestive system. Dates can also be added to fruit salad and in a range of sweet and savory dishes.